Imagine my surprise when I arrived in Paro, Bhutan, was met at the airport by two very charming men, Kanchzen (my guide) and David (my driver), driven about 10 minutes up a hill outside of town to the Uma Paro boutique hotel, introduced to my butler Jeewan and shown to my 1,200-square-foot villa. It was a bit like waking up in Oz and seeing everything in Technicolor. Or having an old dress turn into a glittering gown and a pumpkin turn into a gilded carriage. I had to rub my eyes and pinch myself to believe it. I really didn’t know what to do first. Explore the delights of my villa: Have a bath in the claw-foot tub? 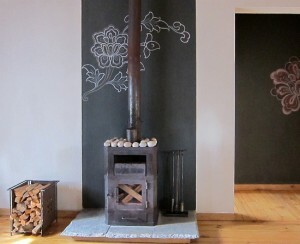 Warm up in front of the wood-burning traditional stove (called a bukhari)? Sit outside on my terrace and use the WiFi service on my laptop? Ask Jeewan to fetch me a fresh fruit smoothie from the hotel’s stellar kitchen? Or just stare out the enormous picture window in my bedroom at the million-dollar view of the Paro Valley and Himalayan peaks? 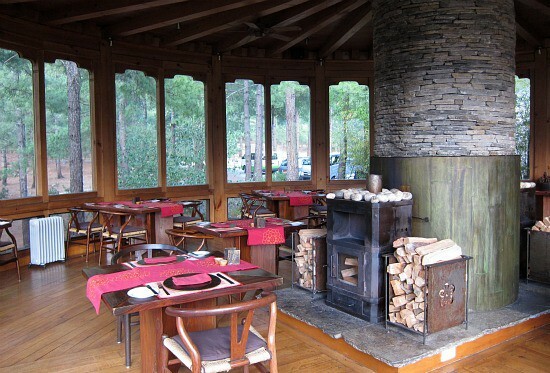 Or explore the hotel: Eat lunch in the glass enclosed circular dining room, Bukhari? 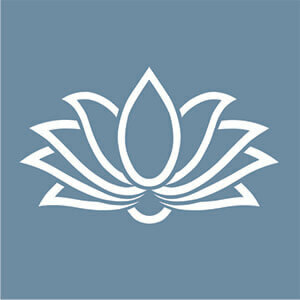 Have a treatment at the COMO Shambhala spa? Swim in the indoor pool and use the steam room in the ladies dressing area? Or sit outside and have a cup of steaming chai? I opted for lunch in the dining room, knowing that over the course of the next five days I would get a chance to try everything else. And I did. 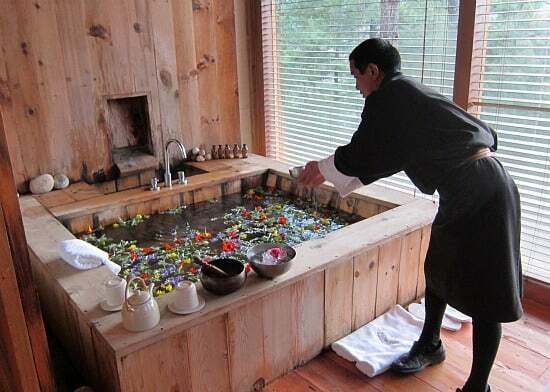 The Uma Paro is part of the COMO Hotels and Resorts, a small chain of specialty hotels and resorts located in carefully chosen places around the world. I have never been to any of the other properties, but they all look at least as spectacular as the Uma Paro. There’s the Uma Ubud in Bali, for example, or the three COCO Shambala resorts: Cocoa Island in the Maldives, the COCO Shambhala Estate Bali and Parrot Cay in the Turks and Caicos. I am sure all of these places, plus the hotels in London and Bangkok, are as special as the Uma Paro. 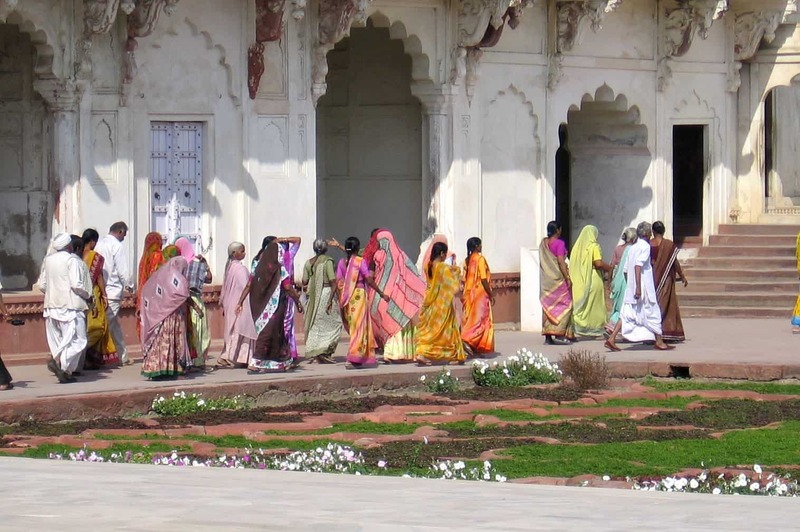 For one thing, a lot of care has been taken to make the hotel as culturally appropriate as possible. The main building is housed in an authentic Bhutanese structure that is several hundred years old, and the cuisine, decor and even some of the spa treatments all pay homage to the culture of Bhutan. 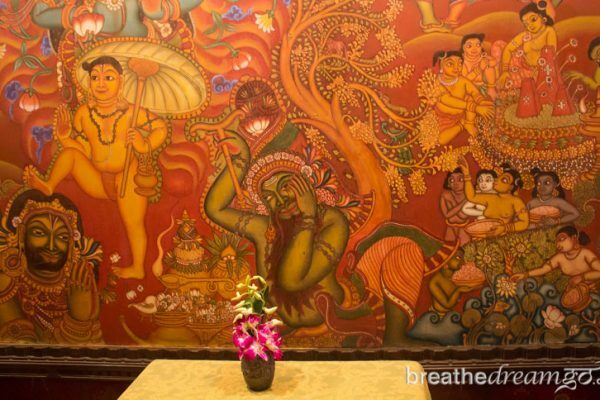 I never felt I was leaving Bhutan when I entered the premises — on the contrary, staying at the Uma Paro was a seamless part of my Bhutan experience. 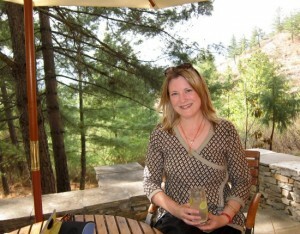 I tried my first Bhutanese meal, ever, in the Uma Paro restaurant, Bukhari. It was comprised largely of red rice and seasoned vegetables and though it was well-prepared, it didn’t grab my fancy. 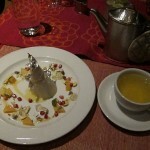 I much preferred the Indian food on the menu, and the fresh salads, and ate Bhutanese only once. In fact, I found the food at the Uma Paro almost too well-prepared: one guest, from the USA, told me she thought it was “bobo.” I never really did find out what “bobo” meant, but I am assuming it’s something about it being a bit too much. But I like simple, fresh, vegetarian food, so I am not the best judge. 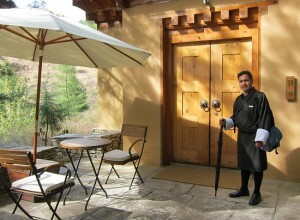 Tourists are required to have a guide with them while they are in Bhutan, and Kanchzen accompanied me whenever I left the property; but while I was on the hotel grounds — which are extensive — my butler, Jeewan, was always close at hand. After I unpacked, I headed back to the main building and Bukhari, the restaurant, to order lunch. I was surprised to see Jeewan in the restaurant, and assumed he was a waiter as well as a butler. No. Wrong. I didn’t get it; it took a moment to sink in. Jeewan was my butler and was taking only my order in the restaurant. In fact, as it turned out, I never needed to speak with another hotel staff member. Just Jeewan. He was my intermediary for everything. When the front desk staff saw me coming, they immediately contacted him, and he would materialize in front of me, as if from thin air. As Jeewan got to know me, he also became very skilled at anticipating my needs. At first, I thought I might have trouble adjusting to life with Jeewan, but boy was I wrong again. I grew to rely on him, and wondered how I would ever be able to live without him. He had a special lunch packed for me when I was ill, and setting out to walk the steep climb to Taktshang Monastery. He found an electrical adapter for me so I could plug in my laptop. He delivered my meals to my villa when I was working and didn’t want to go to the restaurant. 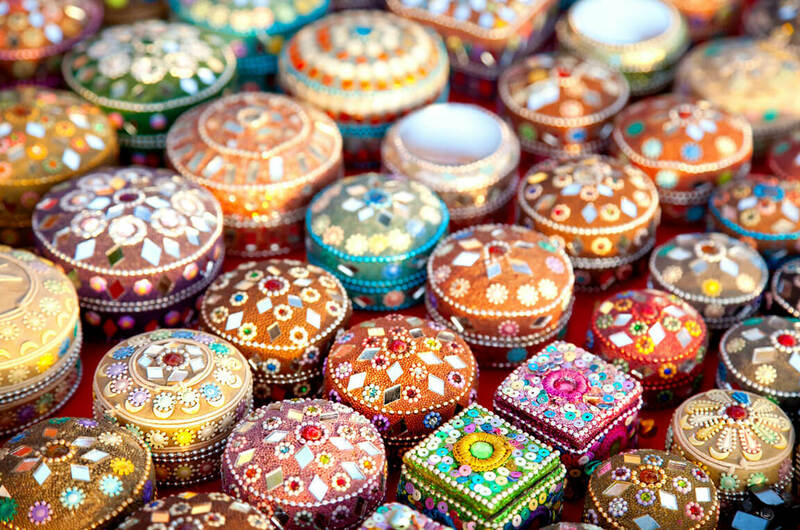 Each night, he lit my bukhari, which heated up my living room. He found a copy of Travelers and Magicians for me, a wonderful Bhutanese movie, and set it up for me to watch on the big screen TV in my bedroom. He also told me quite a lot about his family and about Bhutanese society — he was real, as well as efficient. Between Kanchzen, David and Jeewan, I got a great impression of the professionalism of hospitality workers in Bhutan — and the warmth of the people. And I certainly got a taste of the COMO magic formula: handcrafted accommodation with outstanding service and an uncanny attention to authenticity. The only problem was that I was getting a little too used to all that space, service and luxury! The bathroom in my villa was about the size of my apartment in Toronto; and I even had rooms I never went in. I never went in the private treatment room, which doubles as a spare room; and I never went in the butler’s kitchen, with its own door to the outside (the butler doesn’t enter and leave using the front door). I almost never used the shower stall, preferring instead the claw-foot tub, and I never stretched out on the divan in my bedroom. Ahhhh, missed opportunities! 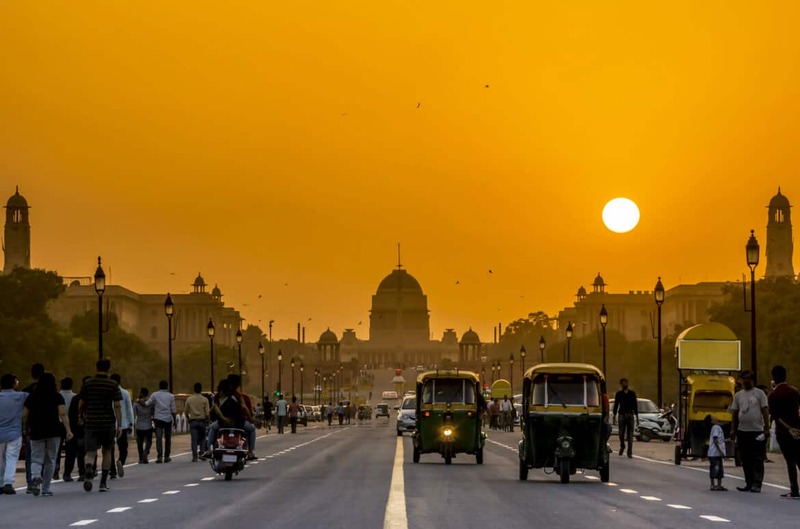 But I did try to use all the facilities the hotel had to offer: I swam several times in the pool, steamed in the steam room, had an Ayurvedic treatment in the spa and walked among the villas scattered about the extensive grounds. Mine was the closest villa, but some of them are quite far from the main building and a golf cart is used to transport luggage and guests. And of course the five days flew by and it was time to leave. It was hard to say good bye. 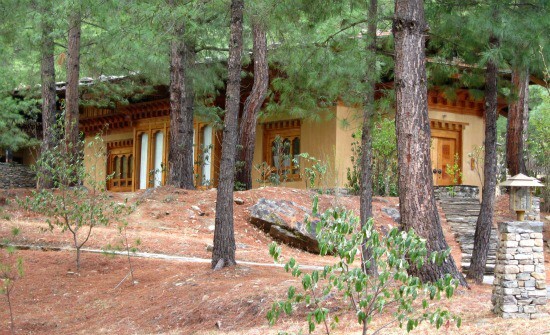 I grew very attached to Kanchzen, David and Jeewan, and loved my villa at the Uma Paro. 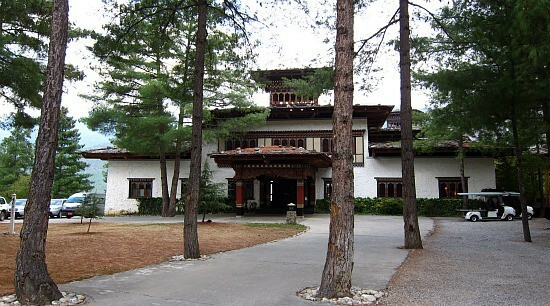 In my memory, my stay at Uma Paro and my visit to Bhutan will be forever inextricably linked. 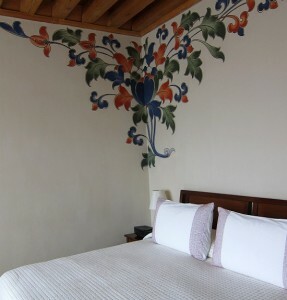 If I discovered Shangri-la at all, while I was in Bhutan, it was at the Uma Paro. 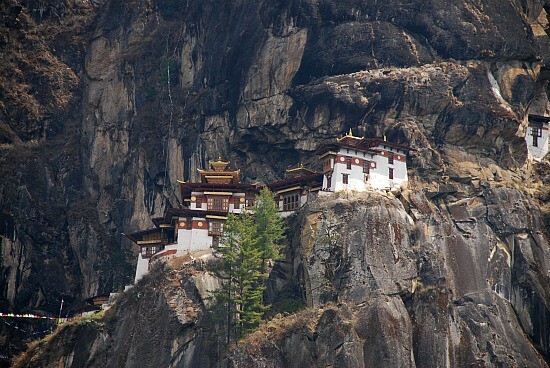 To read more about my adventures in Bhutan, please read Bhutan: Is happiness a place? 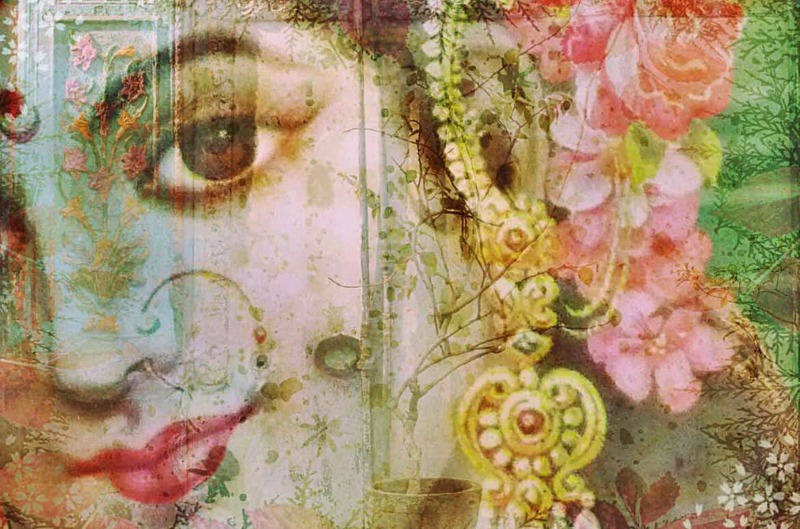 Buy Song of India, a collection of 10 feature stories about my travels in India. E-book now only $1.99. « Bhutan: Is happiness a place?